The precise age and former role of this fascinating old building is uncertain, but parts of the structure are almost certainly almost half a millennium old. Since beginning to provide accommodation to travellers, Childwall Abbey has reputedly entertained several notable actors and artists including Ellen Terry, Henry Irving and J M Barrie. Fans of the Fab Four will also be interested to learn that the place hosted the band during their time as The Quarrymen. 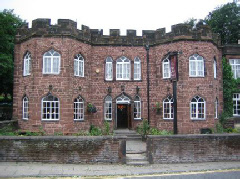 Childwall Abbey offers just seven guest rooms, a bar and restaurant. The M62 motorway is little over a mile away, while Liverpool John Lennon Airport is also within easy reach. The city centre of Liverpool and attractions such as the Albert Dock and museums are around four miles away to the west. The hotel is also conveniently located for towns such as Widnes, Runcorn and Warrington.